When Mohammad Dehghan was growing up in Iran there was never any doubt that he would go to university. With a particular interest in math and science, he was originally directed toward a major in physics. However, his passion was elsewhere. Starting at about 9th grade he became fascinated with anything that involved wiring. So much so that by a few years later he’d developed the skill and confidence to wire an entire house. As he set out to apply to universities his brother encouraged him pursue his passion and he came to the United States to do so. He was 18. Mohammad started at Oklahoma State University and then transferred to California State University at Sacramento, where he earned both a B.S. and M.S. in Electrical and Electronic Engineering. Mohammad started with Cammisa + Wipf 31 years ago, when he was still a graduate student. While he thrives on the challenge and variety of his work, it’s the ultimate results of the work that fuels his passion. Designing systems for hospitals contributes to people getting well. Designing systems for schools contributes to children being educated. Designing labs with effective environments for research and teaching helps science move forward. His work at Cammisa + Wipf impacts positive outcomes. Mohammad’s areas of expertise include the design of complex electrical systems, electrical building lighting, power distribution, emergency generators, control systems for electrical and mechanical equipment, cable management for IT systems, fire alarms, nurse call, code blue and life safety systems. He has managed several hundred hospital projects, laboratories and educational facility projects covering all the functional electrical requirements of those facilities. 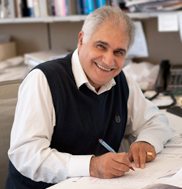 Mohammad is a professional engineer registered in the states of California, Oregon, Washington, and Arizona, and a member of the Institute of Electrical and Electronics Engineers (IEEE) and the Electrical Power Research Institute (EPRI).